Making a small room seem larger is probably one of the most common challenges we come across when staging a home for sale. There are tons of tricks you can try, but the following tips are tried and true, and our go-to tactics for making a space seem more airy. Although dark colours can be dramatic, but dark colours tend to absorb light. This can make a room feel cozy, but also seem smaller. Opting for lighter colours and flooring will help open the room up and make it seem airy. Don’t worry if you can’t or don’t want to invest in changing the colour of dark flooring before you leave – a fresh coat of paint on the walls and ceiling will help the room feel taller by blurring the boundaries and causing the eye to travel up. If you’re worried that light coloured or white walls will seem clinical and cold, try accenting with warm textures and fabrics, like fuzzy throws, chunky blankets, or rustic, wooden picture frames. If you’ve ever walked into a small room and felt like something is just not right, look at the furniture. Pieces that brush up against the boundaries of a room, or heavy, weighty pieces eat up usable space and are too large. When staging your home, store your larger pieces and opt for renting those that are lower to the ground, which creates a feeling of openness simply by leaving more space above them, and pieces with exposed legs. You can also pull furniture away from the wall, even just a few inches, to help the space seem bigger. While natural lighting is your best bet to opening up a room, creative use of artificial light can make your room feel airy and calm. Instead of harsh top down lighting that casts light on a smaller space, try using smaller ambiance and task lighting, spread around the room. This will highlight different areas of the room, and in effect, drawing the eye. Every article on making a small space seem larger includes a tip on adding mirrors because mounting a mirror really is one of the best ways to trick the eye into perceiving more space. Place a mirror across from a window to reflect natural light. It seems silly but ditching the curtains in favour of a bare window is another great way to make a room seem larger. Curtains keep the eye from taking in the outside view, even when they don’t cover the whole window. They also add to the overall clutter of a room. 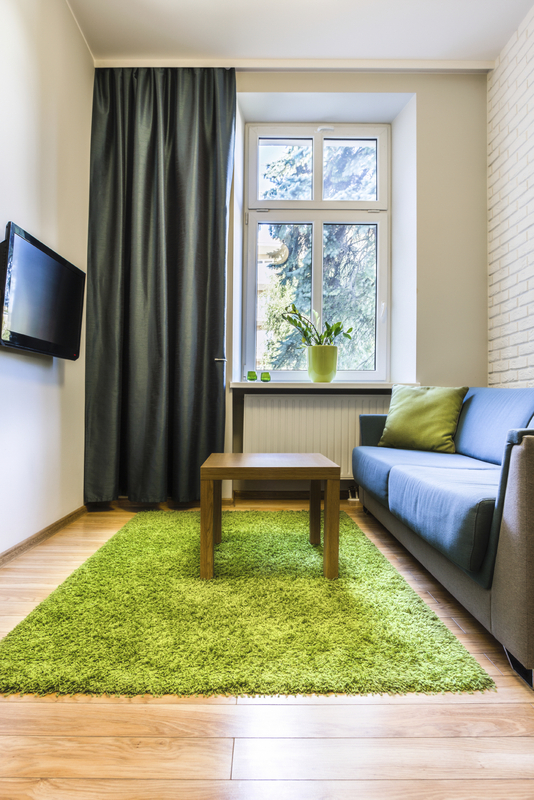 Eliminating the window coverings keeps the space simple and clean. If you want privacy, try shutters or lightweight blinds instead. Or if you feel like you need to use curtains, use a bar that extends far beyond the window frame so you can fully expose the window and the view beyond. Ultimately, the best solution for creating space where there is none is to keep it simple. The more pieces, posessions and patterns (read: clutter) you have in a space, the more cramped it will feel. Choose a few cherished knickknacks and pieces of art to put on display and put the rest in storage. This entry was posted in Home Decor and tagged decorating, Home Selling Tips, Interior Design, paint, staging. Bookmark the permalink.